We offer one scholarship award each year to support an aspiring immigration barrister to complete the vocational stage (BPTC) of their training, whilst gaining practical legal experience through working with us as a legal associate. The Richmond Chambers Scholarship is offered to a full-time legal associate who wishes to study the BPTC on a part-time basis over 2 years alongside their work. We offer an award of £10,000 to assist in meeting the cost of the part-time BPTC course fees. This may be taken as a lump sum at the start of the 2 year course, or as £5,000 each year. The scholarship award is not affected by any other awards or scholarships that may be received from other sources and is conditional upon remaining employed as a legal associate for the 24 month duration of the BPTC course. In addition, an interest-free study loan of up to £10,000 is available to the successful scholarship student. The Richmond Chambers Scholarship is available to all legal associates who are currently employed on a full time basis with Richmond Chambers and who have successfully completed a probation period. 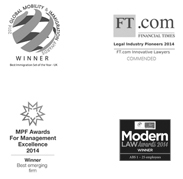 We’re proud to have contributed to a variety of national newspapers and legal industry publications.